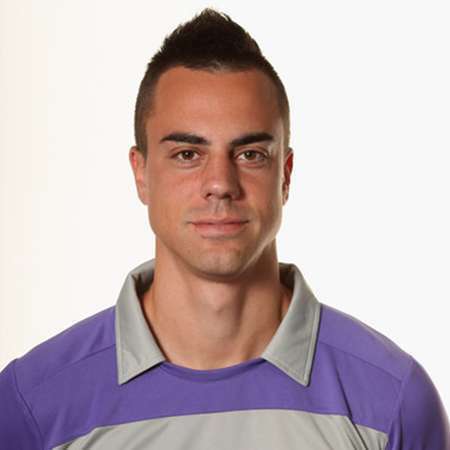 Diego Orlando Benaglio is a Swiss footballer who is playing in the Current Team of Vfl Wolfsburg in the Bundesliga as a goalkeeper wearing Jersey No.1. He is the Goalkeeper of Switzerland National Football Team as well. Diego Benaglio was born in the year 1983 September 8 at Zurich, Switzerland. He is 30 years old cherishing the height of 194 cm and has the body weight of 89 kg. Diego Benaglio is a married man. Nadin Benaglio is the name of his spouse. He has Child, a daughter, named Melija Benaglio. According to the 2012 salary statistic, he salary is recorded to be 3 million Euros. His current market value is 11 million Euros. His agent is KBM. Diego Benaglio is a talented goalkeeper. He has strong right foot. He is good in aerial activities and kicking. He has got good height having good reflexes to tend his body in order to prevent the goal shots from entering inside the box. He has good sense of positioning in the box to stop the shots. He has good concentration on the ball having good command in the goal box area. However, his eccentricity and penalty saving skills are needed to be improved. Diego started his youth career in the year 1993 joining at the native club Spreintenbach. In 1997, he moved to FC Baden in enhance his skill. In 1999, he joined with his home side club Grasshopper Club Zurich and made his professional move. He spent two seasons in this club appearing in 23 matches as a goal keeper. Still in his teens, he joined with Germany Club VfB Stuttgart. But he appeared exclusively from its reserve team called VfB Stuttgart II for the continuous three years in 37 matches. Moving to Nacional in 2005, he became the first choice in the team. It was during his first year with the club, where the club was qualified for the UEFA Cup. Spending 3 seasons with Nacional, he appeared in 69 matches. In 2008, Diego returned to Germany and joined with Vfl Wolfsburg. Since 2008, he has been in the team. In the 2008/2009 season, the club was honored with winning the Bundesliga Champions for the first time in the club’s history. He then appeared significantly on the following year due to injury. He extended his contract until 2016 with this club. He has spent more of his professional years playing at Germany Clubs. Diego has the experience of playing in under-19, under-20 and under-21 matches from the Swiss National Football Team in the year 2001, 2002 and 2003-2005 respectively. Since 2006, he has been promoted in the first team of the Swiss National Team. He has appeared in 55 cap matches including the experience of representing Switzerland in two World Cups. In 2012, he has represented Switzerland appearing in 4 matches in Switzerland Olympic.